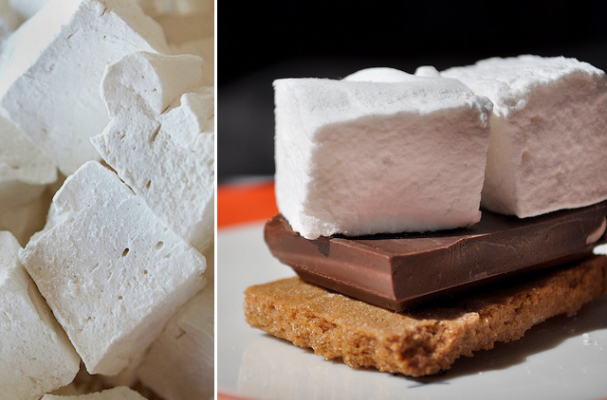 There's nothing quite like the perfect homemade marshmallow recipe. Naturally gluten free & milk/dairy free, homemade marshmallows are nothing like the store-bought variety - nothing. They're fluffy and dense, sweet and creamy, just a little sticky and utterly delicious. Perfect for homemade hot chocolate or just a bite to eat, there's nothing quite like the sheer pleasure of homemade sweets. Below is one of the most decadently delicious homemade marshmallow recipes I've found to date -- gluten free, milk/dairy free and bursting with intense cardamom (or your favorite spice) flavor. Whisk together confectioner's sugar and cornstarch in a small bowl and set aside. Soak the gelatin sheets in a bowl with 1 1/2 quarts of ice water and set aside. Grease a 9×13-inch baking dish with cooking spray or vegetable oil. Line the bottom with an extra long piece of parchment paper (the paper should drape over 2 sides of the baking sheet), then grease the top of the parchment paper. Bring a medium saucepan filled with 1-inch of water to a boil. While the water is heating, drain the ice water from the gelatin sheets, carefully squeezing out any excess water. Place the gelatin-filled bowl over the saucepan and allow the water to continue simmering until the gelatin has melted, occasionally stirring with a rubber spatula. In the bowl of a stand mixer fitted with whisk attachment, combine 1/4 cup corn syrup and melted gelatin with the mixer set on low. Mix sugar, 1/4 cup corn syrup and 1/2 cup water together in a 1 1/2-Qt saucepan. Cook over medium-high heat until a candy thermometer reaches soft ball (240-245°F). Remove from heat. With the mixer still on low, carefully pour the hot sugar mixture down the side of the bowl (into the gelatin-corn syrup.) Once all of the sugar has been added, set the mixer to high speed and mix for 5 or so minutes, until the candy becomes opaque, white and fluffy. Set the mixer speed to medium and slowly add the flavoring extracts, ground cardamom and salt, making sure to scrape down the sides of the mixing bowl. Continue to beat the marshmallow until it becomes thick and very fluffy. Pour the marshmallow into your prepared baking dish - don't worry about smoothing off the top, it should self-level. Allow the pan to cool for at least 6 hours or overnight. Once the marshmallow has cooled and set, dust the top with the powdered sugar/corn starch mixture. Using the exposed parchment "tabs", lift the marshmallow straight up out of the baking dish and set on a cutting board. Using a sharp knife, cut into 1-inch squares, dusting the sticky sides with more of the sugar-cornstarch mixture as you go along. Store in an airtight container for up to 1 week. Serve with, well, anything. Check out more great marshmallow posts! I don't have access to gelatin sheets, what would the amount be to substitute powdered gelatin? These look lovely!! The substitute ratio I've seen is 1 Tbsp. plain gelatin for every 4 sheets. One package of unflavored gelatin (like Knox) is about 2 1/2 teaspoons. For another recipe, one that I know has the right amout of powdered gelatin, go to my website, see my blog page, and click on the category "candy". I'd give the direct link, but it triggers this site's spam filter. sure I'll be informed many new stuff right right here! Good luck for the next!